As well as the regular Rain spray and the water-saving SmartRain pattern, this hand shower offers a fantastic bonus: a soothing massage spray to massage your head and neck with its gentle, pulsing flow. In addition to promising an indulgent shower, this set includes many other user-friendly features. Our QuickFix system makes installation of the included 600mm shower rail simple and trouble-free by letting you reuse existing drill holes or place them between your bathroom tiles. The TwistFree hose means getting your shower hose in a tangle is no longer a problem. Thanks to the SpeedClean anti-lime system and the hard-wearing sheen of the GROHE StarLight surface, these fittings are effortless to maintain. And the GROHE EasyReach tray add-on is a user-friendly solution for your shower gel and shampoo. SmartRain provides a balanced and soft water flow to refresh your skin. Indulge in the sensation of a warm summer rain – and the reassuring knowledge that meanwhile, you are actually conserving precious natural resources. Our intelligent SmartRain technology comes with all the benefits of our original Rain spray, but with a reduced flow rate, allowing you to save water without compromising on your showering comfort! Reduce the water consumption of your shower by up to 40% with our GROHE SprayDimmer. This continuously variable feature allows you to reduce the water flow rate in the SmartRain spray mode of your GROHE shower head – without compromising on your showering comfort. 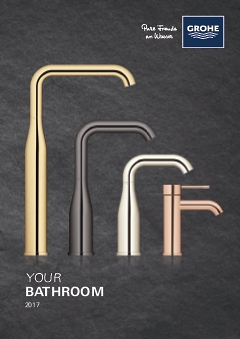 Enjoy a luxurious showering experience and a conservation-conscious life style with GROHE.